AFP Vice Chief of Staff LtGen. 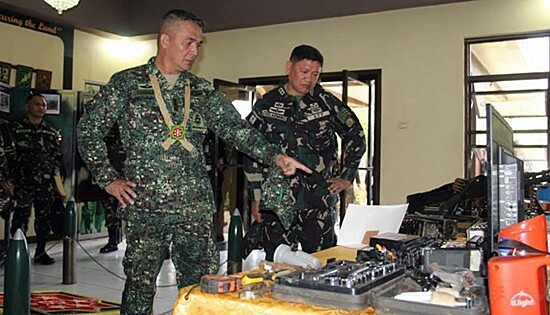 Romeo Tanalgo inspects the high powered firearms, ammunitions, claymore mines, flat screen TV, satellite cable, generator, chainsaw, first aid kit, foodstuff and subversive documents recovered by 19th IB and 87th IB during encounter with NPA rebels. CAMP VICENTE LUKBAN, Catbalogan City – The Armed Forces of the Philippines second most ranking officer paid his first visit to the home of the 8th Infantry “Stormtroopers” Division, Friday. Lt. Gen. Romeo T. Tanalgo AFP, Vice Chief of Staff, Armed Forces of the Philippines was accorded with full military honors, and was warmly welcomed by Major General Jet B. Velarmino AFP, Commander 8ID, along with officers and civilian employees of the Command upon his arrival at 8ID Headquarters. After which, he was given a situation briefing on the Internal Peace and Security Operations’ (IPSO) accomplishments. Highlighted are the seizures of NPA high powered firearms and several war materiels while extending humanitarian assistance and disaster response during the recent typhoon that hardly hit Northern Samar. Maj. Gen Velarmino pointed out during the open forum that 8ID initiated numerous peace covenants of the local candidates. Lt. Gen. Tanalgo reiterated the guidance of the Chief of Staff, Armed Forces of the Philippines to be non-partisan, assure the community for a peaceful and credible election and exercise soldiers’ right to vote. He further commended the 8ID for their enthusiasm in serving the local populace with highest standard of honor, dedication and professionalism. Maj. Gen. Velarmino expressed his gratitude to the Vice Chief of Staff, AFP: “We are truly honored to know that our Vice Chief of Staff appreciates our advocacies and programs towards creating an environment conducive for a sustainable peace and development in the region”, he added. NAVAL, Biliran – With only a few months away before the full implementation of the K-12 program, DPWH-Biliran District Engineering Office (BDEO) is now fast-tracking its construction of School Building Projects funded under different batches of DepEd’s Basic Educational Facilities Fund (BEFF). As of January 31, 2016, funded under Batch 1 and 9 with an appropriation amount of P168.3M, out of 19 School Building projects, 10 are already on-going, 8 are still not yet started and 1 is completed. The completed project is the construction of Senior High School 2-storey, 4 classrooms School Building at Naval Night High School, Naval, Biliran. The project was completed on December 2, 2015 with an appropriation amount of P6.3 million. For projects funded under Batch 3, out of 6 school building projects, three of these are already on-going, one has not yet started while 2 projects were just bided out. Batch 5 on the other hand is composed only of one school building project with an amount of P8.6M. It was not started yet because there is no soil exploration result yet. School Building project under Batch 6 which also composed of one school building project in Elementary and Junior High School was just recently completed on January 24, 2016. The completed project is the Construction of 1 storey, 2-classrooms (toilet attached) in Elementary and Junior High School Building in Capayas Elementary School, Cabucgayan, Biliran with a budget amount of P2 million. Binongtoaan Elementary School in Culaba, Biliran funded under CY 2014 BEEF Batch 4B was also completed on November 3, 2015 with a budget amount of P1.9M. Biliran DEO has also three projects on Technical and Vocational Facilities/ Workshop Building for Senior High School with an amount of P7.2M. Two of these projects are already on-going and one is set to start after Notice to Proceed (NTP) has been issued. In totality, there are 118 classrooms for Senior High School in 19 school sites, 31 classrooms in Elementary and Junior High School in 8 school sites and 3 Technical and Vocational Facilities/ Workshop in three sites. District Engineer, David P. Adongay Jr. reiterated to the contractors that although school building projects are being fast-tracked, its quality should not be compromised. Completion of all school building projects is set to be done before opening of classes on June 2016. 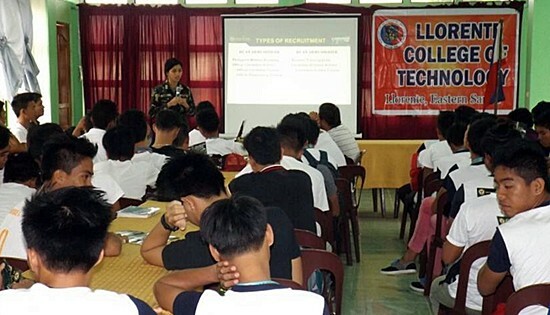 2Lt Marjorie Siwa presented the Comprehensive Local Integration Program and conducted a career guidance for a career in the Philippine Army during the Information Awareness Drive to 200 youths of Llorente College of Technology last February 19, 2016. ORAS, Eastern Samar – Personnel from the 14th Infantry (Avenger) Battalion, Philippine Army conducted an Information Awareness Drive to two hundred (200) youths from Llorente College of Technology held at Municipal Social Hall, Llorente, Eastern Samar on February 19, 2016. The topics discussed are the NPA infiltration and deception in the youth sector, Comprehensive Local Integration Program (CLIP) and Career Guidance on how to apply to become Officer and Soldier in the Philippine Army. The Information Awareness Drive by 14th IB is in response to the appeal of Mr. Antonio Bocar College Administrator of Llorente College of Technology in order to save and protect the students towards NPA recruitment to become prospective party cadres especially those who are residing in the upstream barangays of Llorente. Lt. Ronnie T. Ebarita, Acting Battalion Commander, encouraged the academe sector to be proactive in educating the students against the senseless ideology of NPA, however, the government has always been an open door for reconciliation and healing for our misguided brothers to embrace peace and re-integrate in the community with their families. The overwhelming support of Llorente College of Technology serve as a role model so that other institution and academe may emulate further contribute in addressing peace and security concern since purely military solution will never be enough to achieve long and lasting peace. “Let us give peace a chance”, Ebarita added. Personnel of 14IB provided manpower assistance during the distribution of Bags and Blessings by the Metrobank Foundation last February 20, 2016 in Guiuan, Eastern Samar. ORAS, Eastern Samar – The 14th Infantry (Avenger) Battalion under the leadership of Lt. Col. Ronnie T. Ebarita, Acting Commanding Officer rendered manpower and security assistance to the Metrobank Foundation during the distribution of Bags of Blessings to the four hundred (400) residents of Guiuan, Eastern Samar on February 20, 2016. 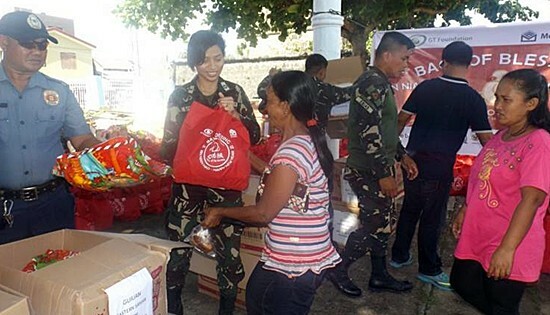 The program kicked off with a holy mass followed by the distribution of bags of blessings which is a nationwide event anchored on Metrobank Bank Foundation primary corporate social responsibility with the active participation of the Philippine Army, Catholic Bishop Conference of the Philippines and other stakeholders. It can be recalled that in 2013, Guiuan was struck by super typhoon Yolanda that brought tragic loss of numerous precious lives and destruction to the properties as well as to local farmer’s agricultural farm products. The Bags of Blessing were distributed in front of the Guiuan Church and the beneficiaries were very thankful for these philanthropic endeavors. The 20th Infantry Battalion under LtCol Hilarion Palma and partner agencies and units inked the MOA for Community-based Skills and Livelihood Training Program for the Palapagnons and was witnessed by the 154 beneficiaries at the old Palapag Church on February 22, 2016. PALAPAG, Northern Samar – The 20th Infantry (We Lead) Battalion, in partnership with TESDA-LNAIS, DepEd-ALS Palapag, and the Local Government Unit of Palapag, launched the community-based skills and livelihood training program for the Palapagnons held at the old Palapag Church on February 22, 2016. The activity was further highlighted with a motorcade around Poblacion, Palapag as kick-off of the event followed by signing of the Memorandum of Agreement between the partner agencies to institutionalize their commitment for peace, employability, productivity and development. This is the first livelihood program opened for calendar year 2016 participated in by 154 beneficiaries from the different Barangays of Palapag broken down as follows: Shielded Metal Arc Welding NC II - 35; Bread and Pastry Production NC II - 34; Housekeeping NC II - 35; Motorcycle Small Engine Repair NC II - 30; and Body Massage - 20. The training will be conducted for the duration of 15 to 30 days. Present during the activity were: Lt. Col. Hilarion G. Palma, Commanding Officer of 20th Infantry Battalion; Ms. Yolanda A. Pajenado, TESDA Head for Instruction Services; Ms. Sonia Mercader, Principal of Palapag Central School; Hon. Ben C. Gurimbalem, Palapag Municipal Vice-Mayor; Mr. Nelito G. Rebato, ALS Coordinator; and Mr. Roberto V. Udtujan, ALS mobile teacher. Pajenado mention in his message said that community-based trainings is same standardized modules for those who are unable to attend a school-based program. This will serve as an avenue to uplift their quality of living, and increase the employment rate of Filipinos”. Gurimbalem, lauded and Philippine Army for choosing Palapag as a recipient of the program with this Palapagnons had the clear opportunity to work both local and abroad. Meanwhile, Palma motivates the beneficiaries to take advantage of the program and utilize it as a way for social and economic progress”, he added. The local candidates during the recital on integrity pledge. Standing third in the left row is incumbent Mayor Marcos Gregorio M. Cerillo who is competing with three other mayoral candidates. ISABEL, Leyte – Nine local candidates were absent during the signing of peace covenant held at the Function Hall of Holy Child Parish here on Monday, February 22, 2016. The figure excludes former Mayor Saturnino Medina Jr. whose non-appearance was considered by Election Officer Virgilio Apostol and other candidates upon sending Allan Borinaga, his secretary as proxy. The nine absentees were candidates for Sangguniang Bayan posts namely: Allan Indolos, Larry Lladoc, Abelardo Salamat, Charlyn Mondigo, Deborah Bertulfo, Eusebio Otadoy Jr, Orlando Tan, Rey Ralph Gorres Jr, and Pelagio Galban. Apostol quoted that the candidates’ attendance to the ceremony is voluntary and that no-show candidates will not be levied. Organized by the local Commissions on Elections (COMELEC) and Isabel Municipal Police Station, the signing of peace covenant aims to promote unity and ensure the conduct of Secure and Fair Election (SAFE) 2016. Witnessing the covenant signing were Rev. Fr. Elrico Fabiolas, Pastor of the Holy Child Parish, Dr. Mario Suson, Principal of Isabel Central School, Police Chief Inspector Randy Jungco, the Chief of Police and Colonel Francisco Mendoza Jr, Commander of Philippine Army’s 802nd Infantry Brigade. Col. Mendoza remarked that the military under his brigade with the PNP will do its part to make the May 9 polls Secure and Fair, though he said a lot about the election rests on the candidates themselves. “Malaking bagay po ang magiging partisipasyon ng mga candidates in ensuring that the election will be honest, orderly and peaceful”, Col. Mendoza said. 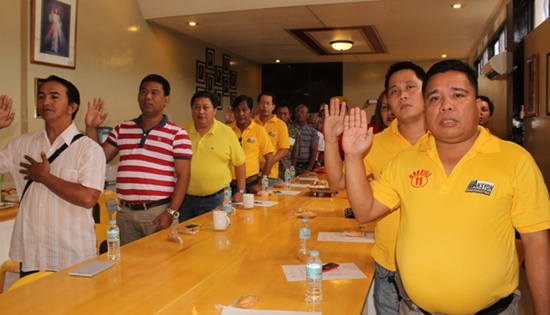 As of press time, 14 municipalities in Leyte had already conducted the ceremonial signing of peace covenant. 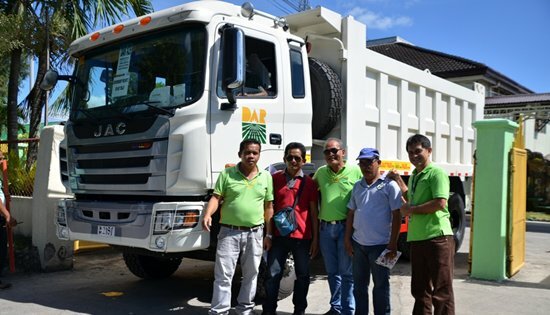 TACLOBAN CITY – Two 10-wheeler heavy-duty dump trucks were given away by the Department of Agrarian Reform (DAR) last week to two farmer organizations from Leyte’s sugarland area. Regional Director Sheila Enciso disclosed that the recipient organizations, the Boroc Agricultural Producers Multi-Purpose Cooperative (BAP-MPC) in Ormoc City and the Libongao DAR Farmer Beneficiaries Association in Kananga, are both into sugar block farming, one of the agricultural-enterprise projects under DAR’s Agrarian Reform Communities Connectivity and Economic Support Services (ARCCESS). The dump trucks are among the recommended common service facilities by the state universities and colleges (SUCs) commissioned by DAR earlier to conduct the needs assessment and design assessment (NADA) for the different agri-enterprise projects under ARCCESS. Enciso further disclosed that the two dump trucks amounted to P11.4 million or P5.7 million each. Cesario Pulvera, manager of the BAP-MPC admitted that the dump truck is of great help to their cooperative particularly in the hauling of sugarcanes. With this truck, according to him, “we can save much money from rentals for we used to rent hauling trucks at P1,000 to P1,500 per trip depending on the distance and situation of the road”. Besides, by offering hauling services too for a fee, “our cooperative will have another source of income”, Pulvera added. As the lead agrarian reform beneficiary organization (ARBO) for sugar block farming, the BAP-MPC has also received from DAR two four-wheel drive tractors, a 90-horse power given in 2014 and a 120-horse power given in 2015. Meanwhile, Enciso stressed that DAR will extend the necessary support services to its agrarian reform beneficiaries (ARBs) thru the ARBOs to make sure that lands awarded to them under the Comprehensive Agrarian Reform Program’s (CARP’s) land transfer component become productive and eventually increase the farmers’ income leading towards a better quality life. 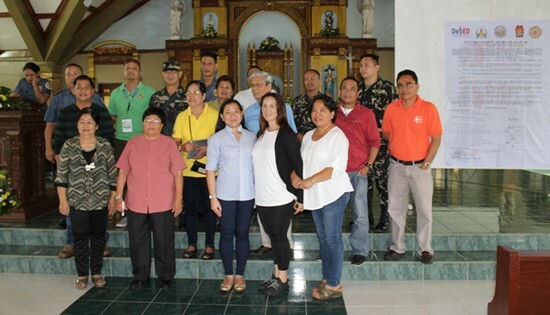 Col. Francisco Mendoza, Commander of 802nd Infantry Brigade with the stakeholders and local candidates during the Signing of Peace Covenant at St. Joseph Parish Church, Dagami, Leyte on February 18, 2016. DAGAMI, Leyte – Local candidates vowed to support the call for a Secure and Fair Election 2016 during the signing of peace covenant here Thursday morning, February 18, 2016. In a ceremony held at St. Joseph Parish Church this town, seventeen candidates were reminded and urged to adhere to the rules during and after the May 2016 polls as Police Chief Inspector Eriprando Castila, the Chief of Police administered the recital of “Integrity Pledge”. This move by the PNP and COMELEC was welcomed by the military quoting that the mere attendance of the candidates justifies their commitment to a peaceful elections as citizens exercise their right to suffrage. As mandated by law, the military, police and COMELEC through established Joint Security Control Center (JSCC) is expected to perform its election duties. Col. Francisco Mendoza Jr., Commander of the Philippine Army’s 802nd Infantry Brigade stressed that soldiers will be deployed to conduct joint checkpoint operations and secure polling places within the region. On Wednesday, February 17, the municipal police stations of Jaro and Palo all of Leyte province had also facilitated the peace covenant signing of local candidates. The three municipalities to have conducted the ceremonial signing of peace covenant are all under the area of responsibility of the 19th Infantry Battalion. Lt. Bryan R. Albano, Public Information Officer of 19th Infantry Battalion averred that police counterparts in municipalities of Sta. Fe, Tolosa, Isabel, Pastrana, Alangalang, Leyte, Carigara, Babatngon and Tacloban City have already scheduled to conduct same ceremony next week. “This is a clear cut manifestation on how much peace is wanted in this part of the region, and that peace is not just the business of the military, much so that of our stakeholders” Lt. Albano said. 2Lt Mary Ellen Fabros, civil-military officer of 63rd Infantry (Innovator) Battalion as speaker during the symposium conducted at Lope De Vega National High School, Lope de Vega, and Rosario Lim National High School, Catarman all of Northern Samar February 11-12, 2016. LOPE DE VEGA, Northern Samar – The 63rd Infantry (Innovator) Battalion under the leadership of Lt. Col Carmelito T Pangatungan has successfully spearheaded the youth symposium both in Lope De Vega and Rosario Lim National High School all of Catarman Northern Samar on February 11, 2016. The symposium is anchored on “IPSP Bayanihan” through intensified stakeholders engagement, the Army facilitated lectures on the New People Army’s (NPA) machination and deceptive strategies in luring the youth into the senseless, and irrelevant armed struggle. Also, the Philippine National Police (PNP) gave lectures on anti-illegal drugs while, Technical Educational Skills Development Authority (TESDA) presented the available vocational courses and trainings to improve the social well-being of the youth. Subsequently, the Philippine Military Academy donated 400 books to supplement learning’s and access on reading materials to level up the education of our youth in Catarman. Lt. Col. Pangatungan gives priority on its information campaign to the youth sector since they are the most vulnerable target of communist insurgent recruitment and encourage the youth to become active partner in peace building because they the future leaders and hope of tomorrow. “It is good to be aware of the social issues of our country and express desire for change but it is not right to bear arms in finding solution for social reform”, Pangatungan added. CATUBIG, Northern Samar – The 20th Infantry “We Lead” troopers spearheaded the planting of 9,850 assorted fruit bearing and non-fruit bearing seedlings during the celebration of the love month from February 12 to 16, 2016 in Las Navas, Northern Samar. 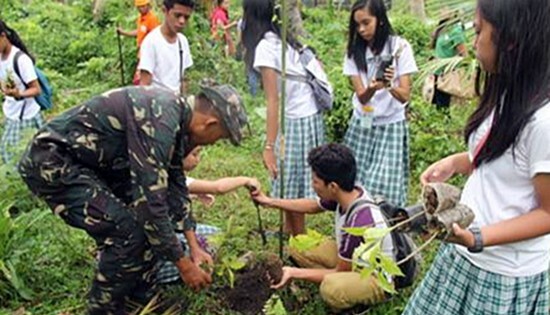 The simultaneous Battalion-wide tree planting activity is in fulfillment of the Army’s commitment in the implementation of the government flagship program that contributed much on the poverty reduction, food security, and biodiversity conservation and eliminates change mitigation and adaptation regarding global climate change. The DENR provided technical assistance and monitoring to ensure the success of the projects while the military jointly identify the suitable tree planting sites for development in Las Navas particularly in vulnerable and hazard prone areas. The overwhelming support of LGU’s, TESDA, DepEd, DENR, PNP and stakeholders made the implementation of National Greening Program more remarkable. Lt. Col. Hilarion G. Palma the acting Commanding Officer of the 20th Infantry Battalion intent to lessen the great impact of the effects of global warming and to save lives. “Let us then anchor ourselves on enhancing and maintaining environmental integrity by undertaking sound and lasting environmental interventions”, Palma added.